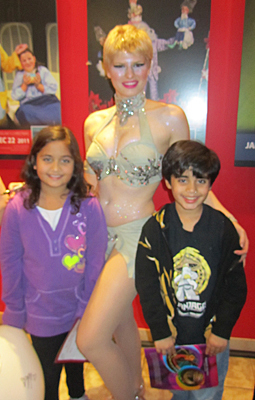 We had so much fun last night seeing Cirque Banquiste at the Rosewood Center for Arts. It was my family’s first time seeing a Lone Star Circus production and it definitely won’t be the last. The show was wonderfully orchestrated–truly an amazing experience that enchants with imaginative artistry and skill. As we walked up to the building, we could see a few performers outside. There were a couple of clowns, a man juggling on stilts and a girl waving around a glittery ribbon wand. One of the clowns walked up to welcome us while the other one invited us in. Their costumes were fantastic! Walking inside, we saw a crowd gathered watching pre-show performances by Lone Star Circus School students. There were jugglers, hula hoopers and students working on aerial silks, all dressed in colorful costumes. A few of the show stars were also out chatting up the crowd. Organ music was playing in the background, creating a carnival like feel. The nice lady playing the beautiful antique instrument told me she only knew the french name for it and that it translates to “Organ of Barbary.” Turns out that the nice lady is Lone Star Circus founder Fanny Kerwich’s mom. Check out my feature about Fanny and how she started Lone Star Circus. While we were enjoying the pre-show, we got a chance to talk to Luciano Anastasini, one of the stars of Cirque Banquiste. He was down-to-earth and patiently answered our questions about his act which features several dogs who do fun tricks and stunts. When our son asked Luciano where his dogs come from, Luciano told us how he has been rescuing dogs since he was a little boy and that his canine buddies in the show are all rescue dogs. He also explained that he enjoys helping people learn how to better communicate with their dogs. How neat is that? When we saw Luciano and his wife, Gladys, perform with their canine crew, it was easy to see the great rapport that Luciano has with his dogs. Watching the dogs perform their funny antics was a hoot! A highlight of the pre-show party for us was when our son Jonathan was picked as a volunteer to participate in one of the circus demonstrations. Jonathan was given a hula hoop and we weren’t too sure what would happen. Our eight-year-old surprised us all by handling not just one, but two hula hoops skillfully! My husband and I had no idea our son could do that! Once we got to our seats, we discovered that we were under a bunch of balloons corralled in a net on the ceiling (read: balloon drop!) and that one of the aerial strap acts would be performing right over us! We were so excited and couldn’t wait for all the fun we were going to have! The show started off with a warm up by clowns Slappy and Monday (Slappy’s Playhouse), followed by a great intro with each of the show stars making a dramatic appearance on stage–nicely done! Slappy and Monday are fantastic! These two hip clowns are hilarious and boy can they dance. The multi-talented duo entertained the audience in between performances with mini parodies of various show acts that left the audience rolling in laughter. I can’t remember the last time I laughed so hard! My son’s favorite part was when Slappy cried “tears” that literally squirted out several feet. I thought we were in the clear until Slappy made her way down into the middle of the theater and we felt her “tears” too! Yikes! The rest of the show was super entertaining as well. We first enjoyed the control and flexibility of Cossandra as she twisted and contorted into various poses. Réjean St. Jules fascinated us with his juggling expertise and especially his ability to play a keyboard using tennis balls that he was juggling in a downward motion. He played three different songs, including the classic “Putting on the Ritz.” AJ Silver displayed his great skill in trick-roping, creating various sized lassoes while spinning the rope at high speeds. Angelo Rodriguez mesmerized us as he flew through the air on aerial silks and also later when he and Miguel Balderrama demonstrated their strength and control in their hand balancing act. Morgaine’s effortless fluidity during her solo on the aerial strap was incredible to watch and especially thrilling because she performed right above us! When she later performed a duet on the aerial strap with her partner Ryan, we were captivated by the synchronized beauty of their arrangement. As I watched the various performances, I felt so happy that my family was able to experience such unique entertainment up close. Lone Star Circus has truly given its audience a gift by using an intimate theater venue to showcase such talented circus artists. I also realized how lucky Dallas is because this is the only place to see the incredible, once a year experience that is Lone Star Circus! At the end of the show, the cast made its way down into the audience. I think the balloons were a little late dropping, but when they did, we sure had a great time batting them around like beach balls. And, of course, before the balloons could touch the ground, most of the kids in the theater rushed to grab one! My twins decided to get autographs on their balloons during the post-show meet & greet. Each time one of the stars signed a balloon, I thought it was going to pop, but it all turned out well in the end. The stars were nice enough to sign show programs and take photos with everyone who asked. What a great experience! Cirque Banquiste is playing for a total of 6 performance dates and opened to a full house. Of the remaining 5 performance dates, the second one sold out as well. There are just 4 opportunities left to see Lone Star Circus perform this year and it’s well worth your time. Tickets are $20 – $45 each and you can get a 10% discount by using the code LSC at www.lonestarcircus.org. Not only will your family enjoy an amazing show, but your ticket purchase will also support Lone Star Circus, which is a non-profit organization. Mina Frannea is a web editor and social media professional. She enjoys the Arts, cooking, enlightening discussions and sharing relevant information with other Moms. A Mom to eight-year-old twins, Mina enjoys writing about family friendly activities around town, theater performances, favorite recipes and activities that keep her children busy and happy. For more posts by Mina, visit her blog at www.themomsjournal.com. Images#3 and #7 by notsoaveragemama.com and loudmouthphotography.com.